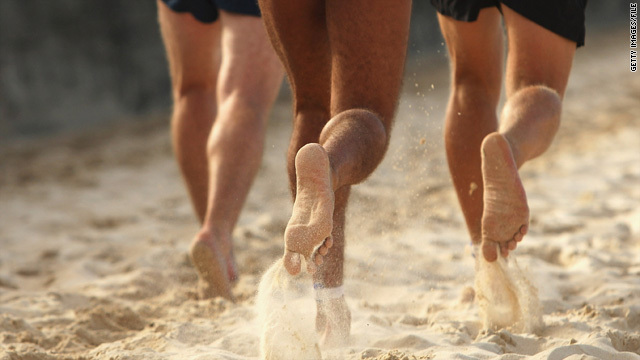 A new study shows that barefoot running causes less impact to the body than wearing shoes. (CNN) -- Terry Chiplin didn't need a Harvard study to tell him what he's known for years. "Barefoot running, for me, is a lot less painful than wearing running shoes," said the 55-year-old Brit, who competed in high school in thin-soled leather shoes and would run shoeless whenever he could. After taking a break in early adulthood from the sport, Chiplin returned to it by buying a fancy pair of running shoes. "I'd come home with blisters, my feet killing me," he said. "So one day, I just said to myself, 'Who cares what anybody thinks? I'm putting sole to earth.' "
Chiplin now teaches running and outdoor fitness in Estes Park, Colorado, and does it shoeless as often as possible. He's among many runners on blogs and list-servs who've been debating new studies about the most efficient running form. Should you go barefoot ? Land heel-first or on the balls of your feet? Are those fancy shoes hurting more than helping you? The study stirring the most buzz was led by Harvard evolutionary biologist Dr. Daniel Lieberman. It's the first to compare how much impact the body takes when a runner is wearing shoes or is barefoot. Using high-speed video, the study revealed barefoot runners strike with their forefoot and suffer less jarring to their bodies. When you're barefoot, you're going to land with the portion of your foot that is most springy. And think of the barefoot run as a game of hot potato -- if you know you have rocks and glass on that surface, you're going to move more carefully and pick your feet up quicker. Shoe wearers strike with their heel and deliver a shock to their overall body that is two to three times their body weight. Lieberman's test subjects were Kenyan runners who had spent their lives running barefoot and the Harvard track team, which runs in shoes. "Runners are responding because they are always interested in the latest science of their sport, and they have a personal reaction to being told that their shoes are going to be taken away," said D. Leif Rustvold, a Portland, Oregon, runner with a masters in anthropological biology who works for a health care provider. Though he switched to barefooting a few years ago and saw an improvement in his efficiency, he predicts barefooting will remain a practice of a minority. "Runners are concerned first about injuries, and barefoot running can seem, at first, like it's going to lead to injury," he said. "Besides, we've been wearing shoes for years. No one is going to roll that back." The other study, focusing on walking form, comes from University of Utah biology professor David Carrier. Carrier is well-known among distance runners for trying to run down a herd of antelope a few years ago to prove that humans were built to run great distances, their survival dependent on their ability to persistence hunt. He found that while humans have evolved to run great distances, we've also evolved to become more efficient walkers than our ape ancestors by doing the very thing Lieberman's study warns against -- landing heel first. His test subjects were volunteers who were triathletes, runners and soccer players. Most mammals -- dogs, cats, raccoons -- walk and run around on the balls of their feet, the study says. Few species land on their heel: bears, humans and great apes -- chimps, gorillas, orangutans. So, run on your forefeet and walk on your heels? "It can be complicated, but I don't think what Lieberman concluded and what our study found conflicts at all with each other," Carrier told CNN. "If anything it shows how complex our feet are, and how much we're learning about the mechanics of movement." Lieberman said his study is not meant to be an argument for barefoot running. "I'm afraid people have misunderstood me," he said. "I'm not in the business of telling people what to do, what shoes to wear or whether to wear shoes at all." Amanda Musacchio, 35, of Wheaton, Illinois, is a member of one of the biggest running list-servs in the country. She and many other runners have interpreted the story as a round-about way to cheer barefoot running. Musacchio wore thin-soled shoes when she was a sprinter in high school without injury. But when she started running longer distances in adulthood, she thought wearing a heavy-cushioned shoe would help. Instead, she racked up injuries. So she went bare again. "I started barefoot running five minutes at a time," she said. "I feel almost as good now as when I did 20 years ago when I was a sprinter. My feet seem to remember how to land properly, on my forefoot, and that improved form has changed my running tremendously." Among the skeptics is self-described "proud shoe wearer" runner Spurgeon Hendrick, who regularly hits the trails outside Atlanta, Georgia, for long runs. He points out that Lieberman's study was partly sponsored by Vibram USA, information that is clearly disclosed on every page. The company makes Vibram 5 Fingers, a thin latex shoe with individual toes that mimics barefoot running. The shoe has sold like hot cakes this past year after they and Lieberman's work were featured in the 2009 best-selling book "Born to Run." "I couldn't run barefooted, or in Vibrams, even if I wanted to," Hendrick said. "I stub my toes on roots and rocks too much, and at my age, I don't have time to wait on a broken toe to heal." Lieberman is adamant that Vibram sponsorship had nothing to do with the outcome of the study, which was also funded by the American School of Prehistoric Research, the Goelet Fund and Harvard University. But many runners are saying that apart from the nitpicking about whether the studies are on the money is one basic lesson: Be more aware of your unique movement. "I think it's very hard, if not impossible, to change body mechanics," said Dr. Perry Julien, a podiatrist who has treated Olympic runners and serves as the co-medical director of the world's biggest 10K, the Atlanta Peachtree Road Race. "And people who try, or try too quickly and without care, are going to wind up in my office." If you're a walker, being more conscious of how your feet hit the ground may make you more efficient. If you're a 200-pound guy who hits the treadmill a couple times a week, barefoot running might not be worth the work necessary to build up the calf and Achilles strength to prevent injury, he said. Stress fractures, tendonitis or plantar fasciitis, a hard-to-heal tissue inflammation that feels like needles driven into your foot, are likely to result for runners who dash out the gate barefoot without gradually working up to it. The podiatrist pointed out that there are many examples of people who heel strike without problems, most famously Joan Benoit. Benoit won the first women's Olympics marathon in 1984, the same era of the record-breaking South African Zola Budd, who ran barefoot.